http://www.flashearth.com/ compares maps. Google Maps aren’t perfect and here is proof. Google Labs has unleashed their U.S. Patent search tool. Now you can see if anyone else has your great idea. Or how many iPhone patents Apple has registered. 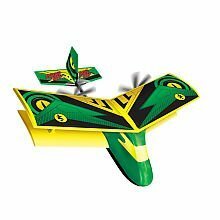 I flew mine this weekend and had more fun than I thought possible given that this foam plane cost $30 at TRU. The Aero Ace has about an 8 inch wingspan and two electric engines protected by the wings. The rest is coffee-cup foam that bounces nicely and can be repaired with Scotch tape. Now it’s sold out everywhere so you will have to wait until January. Worth it. The folks at Lifehacker must be reading our minds. You have had some great questions about setting up Windows Movie Maker and downloading video from camera to computer. #1 – Villanova – you get a laptop as a freshman, new one end of sophomore year, 60% of the campus is wifi. MIT is second on the list and Stanford doesn’t make the top 10. Read the Chronicle writeup here. See the full Forebes report here. Pictures, too. Ok, they didn’t interview the OS itself. But one of their editors did visit with a team of MS techies to talk about Vista. Many good questions were asked including some related to gaming. You may remember my “Draw Your Own Furniture” post from awhile back. Well, some enterprisine Cornell students are working on creating an open source, desktop fabrication machine for home use. The idea: design your own object and print it out in 3-D right there at home. The website has actual videos of the machine in action.